WHAT COMPOSITION:The product consists of ABS plastic ,temperature sensor,Infrared temperature measuring element,microcomputer controlled circuit,LCD,backlight and buzzer. 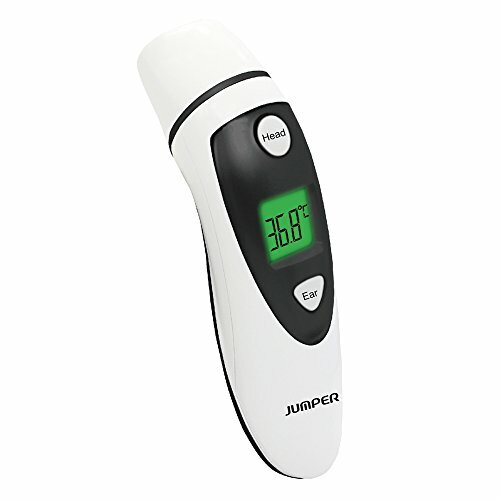 CONVINENT for USE: NO CONVINIENCE would be caused to your life.the Backlight LCD display showing you what the temperature is so it's easily readable in the dark, the JPD-FR401 infrared thermometer takes human body temperature for clinical or household use,it applies to all age groups and those who are suffering from a fever. PROFESSIONAL MEDICAL EQUIPMENT:The cooperation with designated hospitals is subjected to precise clinical verification,with the support of extensive clinical data and professional medical experts. MUTIFUNCTIONAL:Dual-modes design (measurement of forehead temperature and ear temperature) ,measures in both Fahrenheit and Celsius , recall last 20 temperature readings, Auto Power off after 10 seconds, LCD Backlight, Fever alarm. MONEY BACK GUARANTEE AND TWO WARRANTY- Our top priority is your satisfaction. We are confident this device won't let you down but we still offer a 30 day 100% Hassle free money back guarantee. If you have any questions about this product by Jumper, contact us by completing and submitting the form below. If you are looking for a specif part number, please include it with your message.